The feeling after leaving a hair salon is special. It’s empowering, rewarding and leaves you with a skip in your step. According to Kaetlyn Miller-Hubbard, owning and running a hair salon gives her much the same feeling. Hubbard opened her business Bryant Miller Salon in 2009 after years of knowing that working in the beauty industry was her calling. At only 26, she took a leap of faith and opened her own salon, which nine years later is doing better than ever. We spoke with Hubbard about her experiences getting into the industry, buying her business, and how she’s operated a successful and enjoyable business for herself and her employees. Hubbard knew from a very young age that she wanted to be a hairdresser. But being born into a family of academics, she also knew that if she was going to pursue hair as a career, she’d be doing it without any help. “At age 20 I put myself through hair school. I started an apprenticeship at 21 and knew it was right spot for me. It fed my creative side but also showed me I had a pretty aggressive business sense, especially in the beginning,” Hubbard said. The first five years of being a cosmetologist are immensely difficult while you build your client list. Hubbard remembers how important it was to focus on client retention numbers and other service numbers, or else, as she says, “you’re going to burn out quickly”. 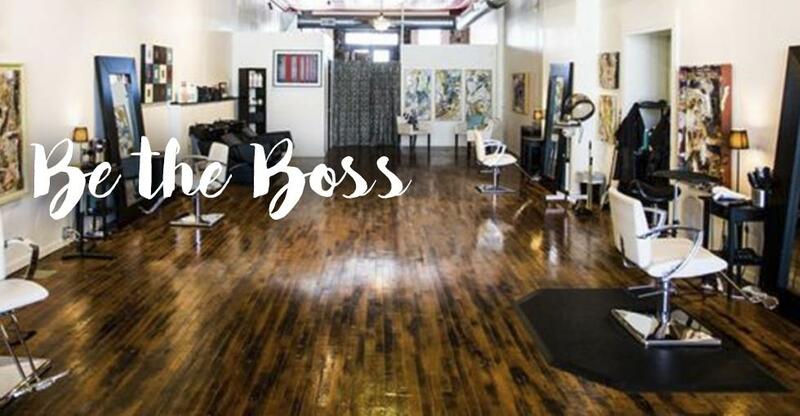 After working in other salons for a few years, she finally decided to open her own shop at 26. “If I hadn’t done it then, I don’t think it would have come to fruition. Hubbard’s salon was originally a vintage furniture shop in a building that was over a hundred years old. It may have been old, and in her words “a total mess”, but it was empty slate for her ideas. Making the idea come to life would prove to be difficult however. Hubbard had a small budget to work with and a small timeframe of only nineteen days to build the space. The design didn’t stop there. She said she wanted it to feel modern despite the shoestring budget. For Hubbard, the goal of Bryant Miller Salon has shifted since opening in 2009. Initially, the salon was a reactionary solution to an issue with a prospective job. After leaving a salon, Hubbard believed she was going to go work for another stylist. The other stylist had ongoing issues locking down a space due to problems with the IRS, so Hubbard had to decide whether or not she was going to go work for someone else in town again, or if she was going to try something new. Ultimately, she decided to open her own salon. Since then, her goal has changed entirely. “The coolest thing to us is when we see people leave the salon with that bounce in their step. One client posted a video of their 5-year-old daughter after leaving the salon with a trim and blow out. The client took a video of her daughter strutting down Main Street bouncing and then turns around towards the camera doing a hair flip. After running her own salon on a commission-based pay, Hubbard finally understood why her former bosses had acted the way they had. In the salon industry, there are three main ways of paying your staff: commission-based, team/hourly based, and booth rent. Starting as a commission-based salon helped to understand why her bosses were always frantic. “It’s so expensive to keep a small business going. That’s why you see those numbers like 3 percent of small businesses making it over five years. Which is understandable. If you’re commission-based, then you’re paying a fortune in payroll tax. If you’re 30 employees or under, you’re really squeaking by some months,” said Hubbard. She realized her former bosses mistake. They were expecting Hubbard and the rest of their staff to work harder, in order to make up the difference in lost revenue. Instead, Hubbard believes bosses should work — just as hard — alongside the staff. “Truly, I wish I wouldn’t have stressed so much. The first few years I stressed for myself, for my staff, and I’m amazed I didn’t worry the salon into the ground,” Hubbard said. She attributes most of her stress to the commission-based pay she started with, explaining that taking so much of her staff’s money made her feel responsible for growing their careers even more. Now, she runs her business as a booth rent salon, which is where hairdressers are able to make the most money. She explains that she wished she had switched to booth rent sooner and thought outside the box from the beginning. “There’s a really big shift in the U.S. right now where a lot of salons are switching to booth rent. I wish I would have started as a booth rent from the beginning because as a booth rent salon, the staff have more skin in the game. I feel like we’re more of a team now as a booth rent salon than we were as a commission salon, so I want salon owners to really think about that. I think having a little skin in the game, for us, really shifted us to hustling together,” said Hubbard. She explains that for salon owners especially, it’s easy to drown in your overheads. She encourages business owners to sit on less products and to take out fewer loans so that during a slow month, you’re not terrified of the amount of overhead looming. “I think the saying, ‘the best days for a business owner are the day the business opens and closes’ is profoundly true,” Hubbard says. The most difficult part for her and for any entrepreneur, is separating yourself from the business. She explains that as an owner, there’s no such thing as paid time off or sick days anymore. The ability to turn off after a tough week or a long day is impossible when you’re the owner. “I’m leaving for vacation soon and even though I’ll say I won’t have access to email or won’t be available, I’d be lying if I said I didn’t check in. On the flip side, Hubbard exclaims, “It’s mine! That’s so cool. To celebrate the achievements and look at my team and think about how none of this would be happening if I hadn’t taken that leap. It’s your baby. We appreciated the opportunity to talk with Kaetlyn Miller-Hubbard, owner and operator of Bryant Miller Salon in Bloomington, Illinois. If you’re interested in more insights on buying, selling, or running a beauty salon, check out our other industry articles here. And, if you’re curious whether there are any salon owning opportunities near you, check out our latest listings of salons for sale.